An original Cinquecento is now on display at the MoMA in New York. The term "art” is highly subjective, but some are better suited to determine what qualifies and what doesn't. Like the curators at the Museum of Modern Art in New York, which have selected the original Fiat 500 to be part of its permanent collection. About a year and a half ago, the world-famous museum acquired an F-series Cinquecento, of the type that Fiat produced between 1965 and 1972. Now it's put it on public display for the first time as part of an exhibit titled "The Value of Good Design,” and will remain on show until June 15. 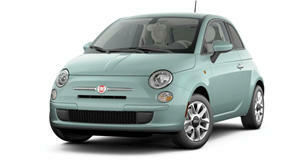 The F-series model of the Fiat 500 was the most popular version that the Italian automaker produced. It packed a tiny 500cc engine good for all of 18 horsepower and a top speed of just 59 miles per hour. But it helped put post-war Italy on wheels and on the track to recovery. All told, Fiat made over four million Cinquecentos from 1957 through '75, and the F-series accounted for the largest portion of those.